2. Wash and scrub potatoes well. 3. Roast in oven for 45 minutes to 1 hour or until potatoes are tender. 4. Let cool before handling. These can be prepped the day before and held cold. 5. Cut ends off potatoes. To make the cracklin’ shape: with the tip of a chef knife, cut downwards along the length of the potato ensuring you get some of potato flesh. This technique is similar to cutting the rind off a watermelon. 6. Fry the long, thick strips of potato peel in a 350°F fryer for 3-4 minutes until crispy. 7. Toss in Cracklin’ Seasoning while hot. 1. Place salt and sugar in a spice grinder and process until fine. 2. Combine sugar and salt with remaining spices. Reserve for Potato Cracklins. 3. Store in shaker for service. 1. Rehydrate potatoes in hot water. Let cool slightly before using. 2. Add the potatoes to a food processor along with the rest of the ingredients. 3. Process on high until combined and smooth. Use spatula to scrape down sides and bottom of bowl as needed. 1. 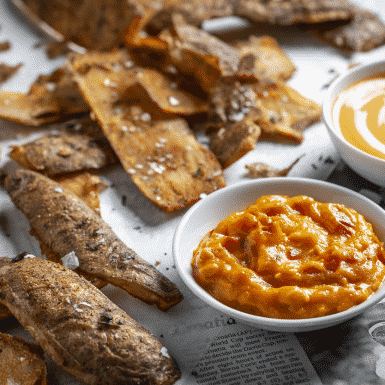 Arrange potato cracklins in a cone-style holder and serve with pimento cheese & other dips of choice on the side. Made these as a trial this last weekend. They were a hit. I’m planing to make them into a Potato Bar for Super Bowl 🏟 LIII. A new HOT MENUE ITEM. Watch and see.